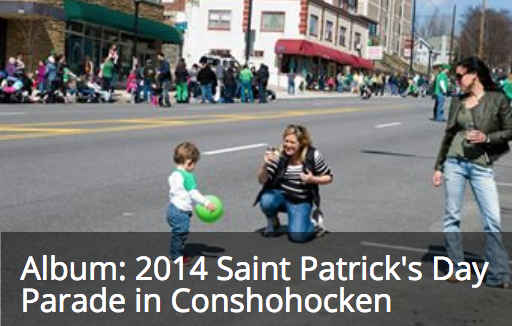 The Montgomery County Saint Patrick’s Day Parade is being held on Saturday, March 16th and starts at 2:00 p.m. It is held along Fayette Street in Conshohocken. The parade is produced by the A.O.H. Notre Dame Division 1 Montgomery County. 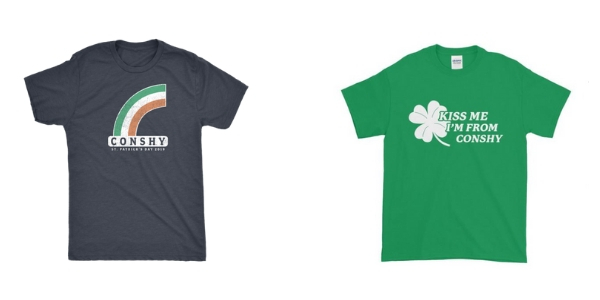 MoreThanTheCurve.com will be selling two t-shirts during the parade at Brunch (500 block of Fayette, eastside) and Sanctuary Blu (300 block of Fayette, westside). We will open at Brunch at 11:00 a.m. and Sanctuary Blu at 1:00 p.m.
Conshy Card holders save 10% on shirts by using promo code CONSHYCARD. Find out how to obtain a Conshy Card, which offers dozens of local discounts, here. If you are coming over the bridge turn right onto East Elm Street and the public is allowed to use the garage/lot at 125 East Elm Street. You can also take an additional right at Harry Street and there is parking at the SEPTA station (go over the tracks and turn right). If you are coming down Conshohocken Road/West Elm into Conshohocken, continue straight over Fayette Street and utilize the 125 East Elm Street lot/garage or turn right onto Harry Street, cross the tracks, turn right and park at the SEPTA station. If you are coming into Conshohocken using Butler Pike from Ridge Pike, parking is harder to find as there are no large lots available. Be considerate if you end up in the neighborhoods. The Grand Marshal’s Ball is being held on Saturday, March 9th at the Elmwood Park Zoo Banquet Hall in Norristown. 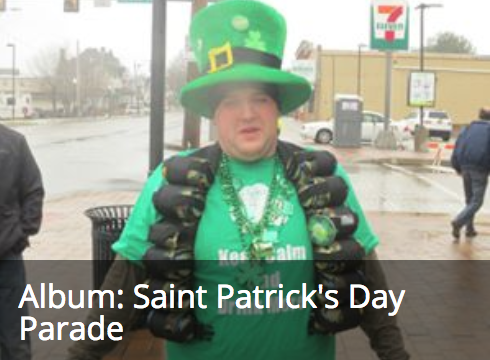 The event starts at 6:00 p.m. Bob Kirkpatrick has been selected to be the Grand Marshal for the 2019 Saint Patrick’s Parade in Conshohocken. The AOH is holding its annual Irish Coffee Contest on Thursday, March 14th at 7:00 p.m. The Bridgeport Ribhouse won top honors in 2018. The 2019 winner is the Swedeland Fire Company! Conshohocken Fire Company No. 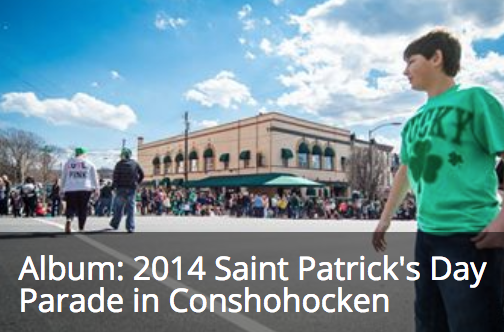 2’s 5th annual Conshohocken St. Paddy’s Day 5K Classic is held prior to the parade on March 16th. Click here for registration and other details. This will be updated throughout the remainder of the week. Baggataway is partnering with Tullamore Dew and doing “Dew and a Brew” combo drinks (a beer with a shot of Tully). There will be offering Baby Guinness shots, Green Tea shots, and Irish Coffees. Tim Williams acoustic on stage at 7:00 p.m., followed by DJ Kev at 10:00 p.m. Specials are $6 Conshy Crushes and Quesadillas. 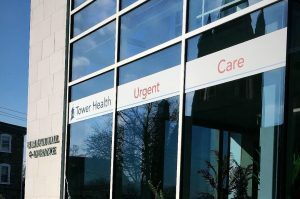 Tower Health Urgent Care is offering their front patio for a view of the parade, plus stop by to join the festivities and to enjoy some free hot chocolate and Tower Health Urgent Care giveaways! Their clinical staff will also be available to provide free blood pressure screenings outside the facility. Baby (spinach, arugula, edamame, green bell pepper & avocado with lemon vinaigrette. Topped with warm garlic rosemary fingerling potatoes & roasted pepitas). Hot Dogs, Hot Sausages, Corropoloease Pies, Conshy Bakery Irish Potatoes, Green Fruit Cups, Mac & Cups Cups, and Mashed Potato Cups. Sodas, Water and Bean2Bean Coffee. Gyro sandwich and drink for $8.99. Will be serving Irish Potato Lattes and Lucky Charm Lattes. Drink special – $4 Coors light 16oz alum, $4 blue moon 16oz alum, $5 Lord hobo Angelica 12oz can, $5 Lord Hobo Hobo Life 12oz can, $6 Lord Hobo Glorious 12oz can, and $6 Lord Hobo Boom Sauce 12oz can. Food specials – Soup (Guinness Beef Stew), Irish Nachos (Crispy fries + cheese sauce + cheddar cheese + chopped bacon + green onion + pickled jalapeno + sour cream), Lamb Salad (Grilled lamb cubes + garden greens + tomatoes + cucumber + onion +black olives + feta cheese + balsamic dressing), Corned Beef Rueben (Corned beef brisket + Swiss cheese + Russian dressing + stewed cabbage + sourdough), Bangers & Mash (Grilled Irish sausage bangers + mashed potatoes + caramelized onion + veal demi-glaze), Corned Beef & Cabbage (Corned Beef Brisket + stewed cabbage + mashed potatoes), Yuengling Fresh Fish Po Boy (Crispy beer battered fresh pollock + shredded lettuce + tomatoes + steak roll + spicy rémoulade sauce), and Dessert (Brown butter cake with ice cream & caramel). The recently opened bed & breakfast will be open for tours from 1:00 p.m. to 5:00 p.m. Also get a ticket for a chance to win a night’s stay. Food specials, specialty cocktails, and $3.00 Miller Light Aluminums. Music with Ty & Rachel that evening. Take a tour of the former mansion and Borough Hall from 10:00 a.m. to noon. From 11:00 a.m. to 2:00 p.m. there will be free hot dogs, lawn games, face painting, a DJ, giveaways, and raffles. Lenny’s is back open! Spend $10.00 and get entered into a raffle to win a $50.00 gift card. Slice and soda for $5.00. Stop by the shop and dig into a pot of gold and see what level discount your coin offers. Scoops will likely not be open for the parade. Food specials include Corned Beef & Cabbage Springrolls, Guinness Beef Stew and Shepard’s Pie. Drink specials featuring Tullamore Dew include Irish Coffee, Irish Mule, DEW & Brew, GreenTea Shot and Pickleback. Live music with the Paul Moore Band at 4:00 p.m., Oakwyn at 7:00 p.m. and a DJ starting at 10:00 p.m. On special are $6.00 Blacksmiths every day in March and on Saturday Saturday’s are $3 Coors Light drafts. Bushmill’s drink specials and a Shepard’s Pie food special. The upstairs bar will be open with games and prizes. House margaritas $5.00, Mexican draft beers $4.00, El Sully can beer $2.00, 2x Lager can $3.00, Tecate can + a Jose Cuervo tequila shot $5.00. House-made Irish potatoes and $1.00 cups of coffee. Live music with Neil McKernan starting at 3:00 p.m. Drink specials and food all day. Stop by for food sampling from Cherchies Artesian Foods. Salsa’s, mustards, and soups will be available to purchase. XTRA will have a few St. Patrick’s Day tops in limited sizes too. The Boatloads will be performing from 4:00 p.m. to 8:00 p.m.
Food specials – Soup (Guinness Beef Stew), Irish Nachos (Crispy fries + cheese sauce + cheddar cheese + chopped bacon + green onion + pickled jalapeno + sour cream), Lamb Salad (Grilled lamb cubes + garden greens + tomatoes + cucumber + onion +black olives + feta cheese + balsamic dressing), Corned Beef Rueben (Corned beef brisket + Swiss cheese + Russian dressing + stewed cabbage + sourdough), Bangers & Mash (Grilled Irish sausage bangers + mashed potatoes + caramelized onion + veal demi-glaze), Corned Beef & Cabbage (Corned Beef Brisket + stewed cabbage + mashed potatoes), Yuengling Fresh Fish Po Boy (Crispy beer battered fresh pollock + shredded lettuce + tomatoes + steak roll + spicy rémoulade sauce), and Dessert (Brown butter cake with ice cream & caramel). Brunch & Bloody Mary Bar from 10:00 a.m. until 2:00 p.m. DJ Mike Pagz at 4:00 p.m. On special are $3.00 Bud Lights. Sunday brunch starting at noon with music from Cary McElwee. There will also be food specials, specialty cocktails, and $3.00 Miller Light Aluminums. Jasper’s will be offering an option of purchasing a $65 wristband that will include a bottomless cup of beer or an Irish mule. It will also include an all you can eat pig roast with, brisket sliders, potato skins, and tater tots. A cash bar will also be an option and guests will also be able to order off of the regular dining menu if they wish. Sign up for any class on Sunday, March 17 by purchasing the class in MindBody labeled PW MINITHON 3/17/19 for $20. Sol Yoga will donate 50% of the proceeds! Must purchase the PW MINITHON 3/17/19 class for the donations to be made. Half priced wings, $5.00 traditional pizzas, $3.00 Corona Lights, $6.00 Blacksmiths, and $5 Bloody Mary’s. Bushmill’s drink specials and a Shepard’s Pie food special.